4. Twenty blue squirrel pelts, trimmed with white velvet tassels and silver thread. The least and oft-overlooked of the spirits of darkness, the spies and couriers and tiny advisors, the least shade spirits are delicate creeping membranes of sooty black lace, or masses of velvet-soft darkness that coil and climb. At other times a least shade spirit may resemble a tangle of slender night-dark serpents with blue-black eyes, or a burrowing coal-black moth with folded and crumpled wings. The "treasure" of a least shade spirit is the velvet shreds, darkness made tangible, that it sometimes leaves behind. Least shade spirits attack for 1-6 hit points of damage; their deceptively soft touch dissolves the physical form, causing a -2 penalty to Armour Class for two rounds and a one-hour loss of 1 point of Constitution if a save vs. spell is failed. They are immune to non-magical weapons, take one extra hit point of damage from all elemental sources save for darkness, and will regenerate one hit point per round as long as they remain within a dark -- or at least notably dim -- environment. A spectrum is a strange little creature of prismatic light; seven small softly-glowing orbs that orbit around each other or float about in an orderly string of bobbing lights. An uninjured spectrum displays all seven colours of the rainbow, one to each orb, and as damage is taken the glowing spheres wink out one by one in sequential order. On rare occasions, the destruction of a spectrum's orbs causes one or more glimmering pearl-like jewels to be left behind, as richly-coloured as the orb it was condensed from. There are rumours of enchanted weaponry which can emulate one or more of the spectrum's cascading offensive powers; one frequently mentioned is a blade sometimes spoken of as Death of Regeneration. Scarlet Pearl Whisper: The Scarlet Pearl Whisper is a ovoid conch pearl the size of the thumb's first joint, of a deep and brilliant blood-scarlet hue. Unlike many similar pearls its colour has never faded; likewise, the flames that flicker across its surface are unusually brilliant. Famed for both its enchantment and its physical qualities, Scarlet Pearl Whisper may be traced through centuries if not longer, nearly always in the hand of a warrior-poet or master-diplomat. Its last known appearance was five decades ago; at that time the gem was said to be grasped in a mesh of delicate clockworks of gold and orichalcum, set in the form of an elaborate gorget. When Scarlet Pearl Whisper is slicked with blood, the donor may call a pearl messenger from the depths of the gem. This wisp of fluid energy may take any physical shape, but always has the appearance of nacreous blood; regardless of form, it may move -- even fly -- at a rate of 270' (90'). The pearl messenger will bear a message of no greater than a two minute span of speech, and will carry that message without fail until it finds the chosen recipient. Only planar boundaries will foil it. It is said by some that if Scarlet Pearl Messenger were to be implanted as the brow-gem of a nakharia, the ivory knight would become flesh and blood. Neither the source nor the intent of such a tale has ever been divined. Shariya, the Saint: Sometimes this ornament is a simple smooth finger ring. At other times it has been recorded to be a teardrop-shaped pendant without a necklace of its own; still others, a slender torc terminating in simple drops. Regardless of its chimerical forms, Shariya the Saint is always composed of snowy white quartz shot through with delicate veins of pale rose. Shariya grants its bearer a measure of enlightened grace. To any but a warrior, the ability to wield a single type of weapon with which they have no familiarity; to a warrior, the ability to cast a single first-level spell twice a day, whether from the cleric or magic-user list. Access to weapons or spells, however, is something Shariya's bearer must gain for themselves. All bearers receive a +2 to saves vs. spells. The more subtle of Shariya's powers is the subtle pressure of emotion -- or, on occasion, a faint voice whispered in the mind -- that hints at a wiser or at least more benign course of action. This guiding power may be heeded or not as the bearer wishes; but Shariya is a sentient bauble, and tales hint of its ability to abandon or even take full control of the one who bears it. Shariya ka'Tjen, the Taloned Dove, was a warrior-saint of the ancient kingdom of Irfanri in the Painted Desert. In certain reaches of the southlands tales of his mercy and miraculous exploits still circulate -- as do tales of the sacrifice of his own heart's-blood to enchant a series of quartz-borne springs for the survivors of the Seven Nights Curse. Or in other words, my family has descended upon my hapless hamsterish head. With stems of granite, thorns of obsidian, and blossoms of grey crystal and shining marble, a stone rose is no more nor less than its name suggests -- a bush, or rarely a vine, of living stone. Stone roses are dimly intelligent creatures of the plane of Earth, and though they cannot move they know when they have potential prey within reach. Stone roses are surrounded by an emotional field generated by the plantlike elemental. Any living being approaching within 20' of a stone rose must save vs. spell or be overcome by a steadily-growing tide of gentle sadness; this growing lassitude causes a cumulative -1-per-round penalty to initiative, to-hit and damage rolls, and saving throws as long as the subject remains within range. If a save vs. charm is also failed, the victim will remain lingering within the aura of sorrow until dragged away or injury allows another save to throw off the dull-mindedness. Against all targets -- affected or no -- a stone rose lashes out with thorned coils, inflicting 1-4 hit points of damage with each of four coils and absorbing the spilled blood as readily as it does sorrow. The oversized, greystone hips of a stone rose sometimes produce 1-4 snowcrosses instead of seed. A vuuriia is a whirling, constantly moving mass of dense, shimmering droplets and orbs of blue-golden water. Equally capable of moving over solid surfaces, through liquids or even through the air itself, there is little that will halt a vuuriia in its erratic and eternal wanderings. Vuuriia are unpredictable and oft maddening creatures, distrusted even by their fellow creatures of water for their tendency to bewitch and overwhelm. Vuuriia attack simply by engulfing a victim within their mass, where the dense, slightly acidic orbs of their bodies batter and etch away at the victim for 1-8 hit points of damage per round. If a vuuriia chooses, it may instead whirl its orbs in a shimmering, hypnotic pattern; once a round, a victim may be so charmed by this display, though an engulfed target may not subsequently be charmed. A charmed victim may then be engulfed, but this action promptly allows a second saving throw. Due to its ever-shifting nature, a vuuriia is immune to all nonmagical attacks and enchanted weapons inflict damage on only a 2-in-6 chance. Vuuriia take full damage from magic regardless of source, however; and double damage from flame of all kinds, magical or no. Chrysomeli are glittering gold and silver bumblebees the size of housecats. Their wings glimmer like pale opal, and their eyes are a rainbow of colours -- and their sting is a perfect shaft of brilliant light. Equally likely to tuck their hives in secluded crannies of the mortal world as they are to nest in the kaleidoscopic plane of Light, chrysomeli savagely defend their nest and brood from all despoilers. In combat a chrysomeli stings, inflicting 1-6 hit points of damage from its burning, laser-like stinger. A chrysomeli's sting bypasses all defense that is not granted by Dexterity ot magic, lacing through mundane armour; it is also venomous, causing blindness if a save vs. poison is failed. The shimmering golden honey produced by chrysomeli may grant special properties if applied to inanimate objects. For example, if applied to a weapon (or ten projectiles), said weapon will deal double damage to creatures of darkness -- or half again as much damage to creatures of earth or water -- for five successful strikes. There is enough honey in a given nest to anoint one weapon or equivalent for every two bees in the nest. Casting this spell causes up to four arrows or other projectile weapons to glow internally, as if a tiny blue-white star burned within each of them. Each weapon so enchanted gains the ability to injure creatures immune to non-magical weapons and half again as much range. Casting this spell conjures a single "star ghost" -- a tiny silvery sphere that trails pale multicoloured flames -- which flies unerringly towards a target designated by the magic-user. The star ghost inflicts 1-4 hit points of damage and stuns the target for one round. The casting of this spell attunes the magic-user, however briefly, to the celestial underpinnings of time and fate. The magic-user has a 50% chance, plus 1% per level, to divine whether a single action would be favorable or unfavorable. Concordance may reach no more than a few hours into the future. With the casting of this spell and a single sung note, the magic-user calls upon favorable stellar harmonies to affect the fortune of a single target. The chosen individual gains +2 to saving throws and to-hit rolls, and a +1 bonus to Armour Class, for the duration of the spell. Casting Blade of the Stars creates a shining blue-white blade of of solid starlight which is wielded as a weapon. Whether as small as a dagger or as massive as a two-handed sword, the damage the "starsword" inflicts remains the same: 2-12 hit points per strike. Individuals injured by the blade suffer a -2 penalty to all rolls for the following round as the blade's strike disrupts their connection to their own fate. Fires From Heaven calls the pale, icy iridescence of starfire to the hands of the magic-user, who may then direct the flames in a cone of icy fires measuring 5'x15'x25'. All caught within the blast take 1-4 hit points of damage per level of the magic-user and are left reeling, at a -4 to all rolls, for 2-8 rounds. Touch of the Heavens infuses a recipient chosen by the magic-user with the forces of the heavens, causing a faint blue-white inner glow. The recipent's next attack -- whether physical or magical -- is augmented by these celestial fires, inflicting an additional 5-30 hit points of damage and stunning the target for two rounds. At first glance one might expect an oalai to be a creature of elemental water; with a coiled shell of glittering sapphire and ten long and delicate tentacles, this white-fleshed, silver-eyed beast resembles nothing so much as an exotic ammonite larger than a burly human's torso. Yet the oalai is a creature of the air, and flies continuously on its own winds and the elemental buoyancy it infuses into its shining shell. Intelligent and inquisitive creatures, oalai gather in small communities and produce objects of startling -- if alien -- beauty. Though they manipulate small objects and tools, an oalai's tentacles are not suitable for wielding weapons. Instead an oalai attacks with its largest pair of tentacles, which are armed with sapphire-toothed rasps and inflict 1-6 hit points of damage each. Four oalai working together may summon a burst of wind in a 20' diameter sphere, concussing victims caught within it for 1-4 rounds. Oalai take no damage from wind or electricity. A shoal of oalai is led by an elder mystic of 5 Hit Dice. This individual may cast spells as a 2nd level cleric and magic-user both, and has an Armour Class of 0. In a morning of frost, Jie Chue was approached by a cohort of young wanderers. They were young, and unblooded; the blade-smith shook his head, knowing their fates. All requests he refused; and the youths turned away with bitter pride. Unmoved, Jie Chue returned to his forge. The last returned to him, and spoke of the wish to lead his companions home. Without a word, Jie Chue gave him the path. Wayedge: A sword with a single sharpened edge -- though not curved, as a sabre would be -- Wayedge is forged of steel as reflective as water, its lone edge a thin line of burning cinnabar. The sword's hilt is of twisted cords of copper and black iron, wrapped in white silk; the pommel-nut is a single teardrop of silver. Wayedge is a sword +1. At any time the bearer of Wayedge may choose to sacrifice the sword's bonus to instead be granted a +1 magical bonus to Armour Class. The blade's enchantments are more useful outside of combat; When set pointmost on the ground and released, Wayedge will yet stand upright upon its point, swiveling to direct the edge of its blade towards any location requested by (and familiar to) its bearer. The sword also contains a hidden power, revealed only when its bearer is under extreme duress. With the sacrifice of all hit points to ignite the blade, Wayedge may be used to carve a cinnabar portal -- in the very air itself, if necessary -- that will stand open for two rounds and transport the allies of Wayedge's bearer to a single closen location. Activation of this power kills the bearer of Wayedge. The most minor of the spirits of light, messengers and "gifts", the least shining spirits are composed of gossamer veils of golden light and drops of shimmering, prismatic color. On occasion a least shining spirit may take the shape of a rainbow-shining scarab -- as if carved of glass -- or a fluttering mass of glittering hummingbirds. The "treasure" of a least shining spirit is the droplets of tangible light that are sometimes left behind after death. Least shining spirits attack for 1-6 hit points of damage; their glittering touch bleaches and wounds the spirit, causing a -2 penalty to all saving throws for two rounds and a one-hour loss of 1 point of Wisdom if a save vs. spell is failed. They are immune to non-magical weapons, take one extra hit point of damage from all elemental sources save for light, and will regenerate one hit point per round as long as they remain within a well-lit environment. Scale of map: 1 square = 10'. All walls, ceiling, etc. are of rough-polished but painstakingly fitted masonry, now well overgrown with mosses and small dry fungi. 1. Entrance Hall: After navigating the brief corridor leading to this room and passing the door (locked with a still-functioning dwarven mechanism), the chamber widens out into a 30'x30' chamber littered with crumbled pillars and loose stone. To the north lies an open archway, and the southwest corner is marked with a door. In this chamber are two orc guards [AC5; HD 1; hp 6, 8; Mv 120' (40'); Att 1 (spear); Dam 1-6; Sv F1; Ml 8; XP 10; 12cp, 14cp and a copper-mounted whetstone] and four cepes [AC6; HD 1-1; hp 4, 5, 3, 7; Mv 90' (30'); Att 2 claws; Dam 1-3/1-3; Sv F1; Ml 6; XP 5], currently clearing the stone for their masters. The cepes are ordered to attack, joined by one orc while the second heads for the main hall to stir the swarm. 2. Main Hall and Living Area: Pungent with unwashed orc and fouler things, this chamber has been roughly converted over into a barracks. Twelve orcs (including the two guards) live in this chamber, four of whom [AC5; HD 1; hp 7, 5, 6, 8; Mv 120' (40'); Att 1 (spear); Dam 1-6; Sv F1; Ml 8; XP 10; 12cp, 8cp and a jelly rat, 16cp, 11 cp and a thin silver ring (1gp)] are present -- and the remaining six could return at any time. The orcs will immediately attack, assuming they are surprised; if warned by the guard they will prepare an onslaught of four burning oil flasks and then order eight cepes slaves [AC6; HD 1-1; hp 4, 4, 6, 5, 3, 4, 7; Mv 90' (30'); Att 2 claws; Dam 1-3/1-3; Sv F1; Ml 6; XP 5] into combat before joining two rounds later. In the northern wall lies a secret door, and a bronze-bound door leading to Nashka's own chamber. 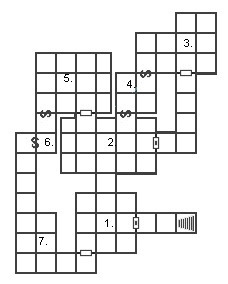 To the east, a locked door enters into a corridor to the slave chamber; immediately after the bend in the corridor lies a hidden bolt trap (1-8 hp damage) in the eastern wall, triggered by a pressure plate in the floor. If the room's contents are searched a total of 234sp, 62gp, and a cache of six bottles of elven wine (20gp ea.) will be unearthed. 3. Slave Chamber: Six cepes [AC6; HD 1-1; hp 4, 4, 5, 3, 3; Mv 90' (30'); Att 2 claws; Dam 1-3/1-3; Sv F1; Ml 6; XP 5] are found within this dry, brush-filled chamber. They will initially attack to defend themselves -- expecting they have been bartered away -- but may be persuaded otherwise. The western end of the chamber is filled with a brackish pool of some unidentified fluid, viscous and dark, but the southwestern wall may still be seen to bear suspicious scratchings (near the secret door). 4. Binding Chamber: This 20'x20' chamber cannot be accessed until both doors have been triggered; each door will click and shift slightly but will not release until both have been discovered and released. The floor is almost entirely encircled with an elaborate binding diagram in silvery-white runes. At the centre of the circle is an iron statue; in actuality a khanabit [AC0; HD 5***; hp 37; Mv 120' (40'); Att 2; Dam 1-8/1-8; Sv C6; Ml 12; Specials: binding, fate's terror, black iron pledge; immune to normal weapons; XP 550], the Iron Judge will reanimate as soon as the circle is breached. Chaotic individuals are attacked immediately if possible, those of neutral alignment are pledged, and those of lawful alignment (or neutrals, if they happen to be good bargainers) are offered a pledge of reward if the warding circle is destroyed. Should the circle actually be destroyed, the khanabit draws heavy bangle-like black iron bracers (+1 AC, -1 damage per die of fire damage) out of the sleeves of its robes -- one pair for each party member that agreed to free it -- and then fades from sight. 5. Nashka's Chamber: Piled with stolen goods -- including a decidedly eccentric "bed" crafted out of the main hall's carved High Table and bundles of plundered grave velvets -- this is the actual lair of Nashka and his two she-orc bodyguards [AC4; HD 1+2; hp 10, 8; Mv 120' (40'); Att 1 (sword); Dam 1-8; Sv F1; Ml 8; XP 15; 8gp, 6gp and a golden nose-ring (4gp)]. Nashka himself [AC4; HD 2; hp 16; Mv 120' (40'); Att 1 (sword +1); Dam 1-8 +3; Sv F3; Ml 10; Special: MU spells: magic missile, protection from evil; XP 30; 32gp, gold and ruby ring with glyphs (500gp)] is a hulking orc of demonic countenance, right down to the forked double tusks, blood-red eyes and patches of black scales on his bestial features, and he attempt to flee through the secrets doors leading through areas 6 and 7 if his cause looks lost. He will not, however, forget the party. In three heavy, steel-bound oaken chests Nashka has squirreled away the swarm's major treasures. The first chest contains 1734sp, 160 2gp-value silver trade bars, and four wolf pelts (15gp ea. ); the second chest contains 1275gp; the third holds a smaller rosewood coffer bound in ivory -- containing three matched massive golden torcs, cast as twisted cables and their looped terminals mounting red coral claws (1400gp ea.) -- as well as a crumpled grey velvet cloak (40gp) and two blood-red potions of healing. The third chest is trapped; lifting the lid instead of sliding it off causes a spring-loaded dagger coated with paralytic poison to launch at the disturbance. 7. Stores and "Pantry": Rustled oxen and the odd elf hang here from rusty meat-hooks driven roughly into the wall. Scattered about are coarse sacks filled with meal, tuns of water and harsh ale and bales of hay for bedding as well as scraps of fine wood, somewhat mangy deerhides and other miscellaneous objects. Five cepes [AC6; HD 1-1; hp 5, 5, 6, 3, 7; Mv 90' (30'); Att 2 claws; Dam 1-3/1-3; Sv F1; Ml 6; XP 5] are here, maintaining the stock. Grim and forbidding creatures, the khanabit (or Iron Judges) appear without warning as if drawn from the very aether. Despite rumours of a land -- or other plane of existence -- where the khanabit are said to live as any civilized race, the Iron Judges are known only as solitary entities of binding fate. Imposingly tall humanoids, khanabit appear like humans chiseled from shining black metal of unnatural suppleness, despite their sharp planes; all lean limbs and high hollow cheeks, they look almost as if their metallic flesh was drawn tightly over sharp bone. Their eyes are featureless slits of blue-black energies, and their hair resembles infinitely fine spun wire or liquid metal. Khanabit dress in heavy robes of icy white or purest black. If actual combat is required, a khanabit lengthens its fingers into long metal talons and attacks, inflicting 1-8 hit points of damage with each claw. It may also bind with myriad hair-fine wires, pinning a victim in place -- though still able to act -- if a save vs. spell is failed. The victim is grated another save each subsequent round. When first encountered a khanabit may elect to invoke fate's terror: those who fail a save vs. charm must flee the creature. A successful save still results in a -1 penalty to all actions for four rounds. The khanabit's preferred method of dealing with others is the black iron pledge. When invoked, a blackened iron brand appears on the subject's body (save vs. spell negates, at a -2 penalty) and the khanabit may set the recipient to any one task, behaviour or similar restriction. Failing to uphold the pledge results in the individual being struck with the iron sickness, having a -6 penalty to all die rolls until the pledge is made good once again. Khanabit are immune to non-magical weapons as well as to fire and fire-based magic. Quiet and yet relentlessly invasive creatures, cepes are sapient fungus-men. The typical cepes stands between two and three feet tall, with a chunky, squat build and relatively short legs; their long arms have hands that terminate in woody claws which function as two fingers and a thumb. Cepes have broad heads – much like a mushroom cap – mottled in reds and rusts, with this colouration extending down their backs while the remainder of their flesh is an off-white or dull tan. Their eyes are large, lidless, and either dead white or jet black. Cepes attack in combat with their claws, inflicting 1-3 hit points of damage per strike. A colony of cepes has no formal hierarchy, all living members spawning from the same source; a single "mother growth" which was once a cepes but developed into a spawning mass of fungal material after "death". Adamarach are large spiders -- generally the size of a decent watermelon, though some are larger or smaller -- composed entirely of glittering crystal. Even their eyes are like beads of obsidian; and the abdomen of an adamarach carries a rosy tinge in its core, signifying the presence of the creature's crystalline entrails. Adamarach prefer to hunt out warm bodies less for their own sustenance as for incubating their offspring. In combat an adamarach bites for 1-3 hit points of damage, injecting a liquid-crystal venom that paralyzes the victim for 1-4 rounds if a save vs. poison is failed. Paralyzed victims are then injected with a spherical, crystal egg (assuming the adamarach has the opportunity to "attack" the victim again), inflicting another 1-2 hit points of damage. Unless removed -- a process requiring a save vs. death ray or the subject dies, or else the intervention of a ranking cleric -- the cyst-like egg remains in the body for 1-2 weeks before the hatchling splits its way through the skin. During this time the host effectively loses two points of Constitution, but gains a +3 bonus to Armour Class as the flesh semi-crystallizes. Unfortunately, the host will also detect as Chaotic, regardless of actual alignment, so long as the egg remains implanted. Set above and yet apart from the rarefied (air, fire) and chthonic (earth, water) elementals respectively, the shining and shade elementals are living embodiments of the elements of light and darkness. Like all elementals, they are native to their own elemental planes of existence; unlike the "lower" elemental types, they may also be encountered freely within the elemental planes of their related elements. Shining and shade elementals function in the way manner as standard elementals unless noted otherwise. Like standard elementals, they may be summoned by staff, device or spell. Shining: A shining elemental appears as a lacy pattern of twisting, weaving light -- the purest of white, the brilliance golden of sunlight, a riot of prismatic colours -- 1' tall and 1' in diameter for every Hit Die of the elemental. In combat, individuals opposing a shining elemental must save vs. charm or be dazzled, taking a -4 penalty to to-hit and damage rolls for the duration of the combat. These elementals inflict an extra 1-10 hit points of damage on aquatic creatures and creatures of the earth, twice that again against creatures of darkness. Shining elementals take double damage from darkness, normal damage from earth and water, and minimum damage from air, fire and light. Shade: A shade elemental appears as a coiling, quivering, effervescent mass of fluid darkness 1' tall and 1' in diameter for every Hit Die of the elemental. In combat, individuals opposing a shade elemental must save vs. paralyzation or have their spirits weighed down, able to act only once every two rounds for the duration of the combat. These elementals inflict an extra 1-10 hit points of damage on flying creatures and creatures of heat or flame, twice that again against creatures of light. Shade elementals take double damage from light, normal damage from air and fire, and minimum damage from darkness, earth and water. Both shining and shade elementals are immune to non-magical weapons. A humanoid race no larger than a turkey, the sauriitru dimly resemble lizard men and their ilk insofar as they are basically-reptilian in broad form. At that, sauriitru dart about in a hunched posture, their stiff and whip-thin tails used as counterbalance and their delicate, narrow-muzzled heads perch atop long and slender necks; they look less human in form than lizard men. But sauriitru are also cloaked in downy feathers in a riot of dappled colours over their strangely jade-like scales, and unmistakable intelligence glitters in their slitted golden eyes. Though some sauriitru clans may be found in the dungeon, others are as likely to be found in the fields and broken forests where they trade -- or compete -- with halflings for living space. It's all the same to the sauriitru and their magpie, hoarding ways. In combat most sauriitru attack with one, or rarely a pair of, fighting-claws slipped over the knuckles of their long-fingered hands, inflicting 1-4 hit points of damage. Ony the most desperate of sauriitru will resort to their natural weaponry, curved sickle-like claws on each hindfoot which inflict 1-3 hit points of damage each. A sauriitru has a 50% chance of being armed with 1-4 glyphstones; these small charms have varying effects, usually to heal 1-3 hit points or to add 1-3 hit points of damage to an attack. For every dozen sauriitru there is a flockleader of 1+3 Hit Dice. A clan is lead by a matriarch of 2 Hit Dice who also functions as a 2nd-level cleric; it is the matriarch who is the source of the clan's glyphic charms. Strange creatures, considered manifest spirits by some, cintamani are skull-sized pearlescent spheres wreathed in milky white coils of flame. Inscrutable and and yet oddly benevolent, cintamani offer blessings of a sort to those who cause them no harm -- and are just as likely to curse those who turn against them. If pressed into combat, a cintamani lashes out with its fires in two attacks that inflict 1-4 hit points of damage each. Attacking a cintamani is much more likely to provoke its wisdom curse: failing a save vs. spells means that for the next twelve hours, the victim is at -2 to all saving throws (-4 against poisons), takes double damage from fire, and may only heal back half of all damage taken. Cintamani which are not attacked -- or, better, are treated with manners and deference -- may instead grant one of the following graces: 1-6 hit points of healing, to be triggered at will; protection from fire; +3 to saves vs. poison; or +2 to other saving throws. All such benefits have a duration of six hours; in the case of healing, the benefit must be used within six hours or lost. Cintamani are immune to any elemental attacks, magical or nonmagical.